Early the next morning we walked onto the beach to get a few more pictures of the ocean before we headed back home. On the edge of town we drove by a marina with a bunch of ships docked. After finding our way down to it we got out to walk on the docks. A couple old ships caught my eye with a grungy look that made me want to photograph. One of them in particular was very worn the paint was peeling, there was rust on all of the metal and even the ship’s name was coming off. 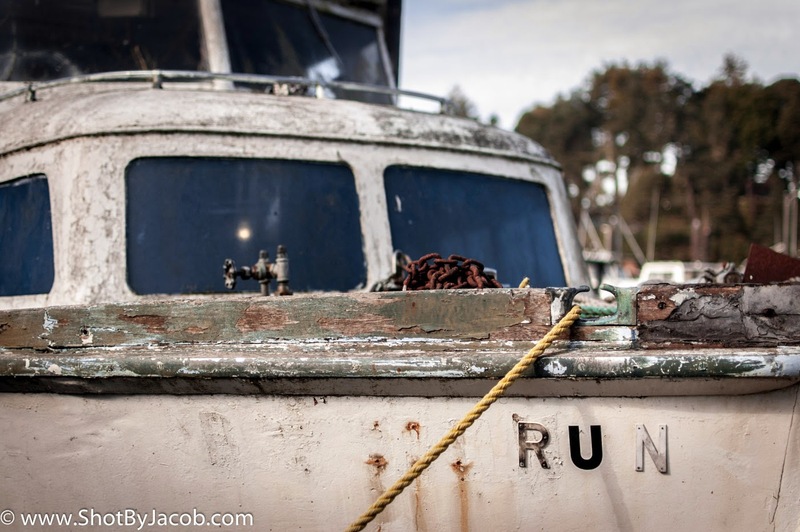 The only discernible word was run so I titled this work “Rum Runner”. In order to emphasize the decaying ship in front of me I created a blur effect on the background and boosted the contrast in the rotting wood. The rusty anchor and chains and even the holes in the side of a ship were a nice orange color and this helped to add balanced with the blue of the window. 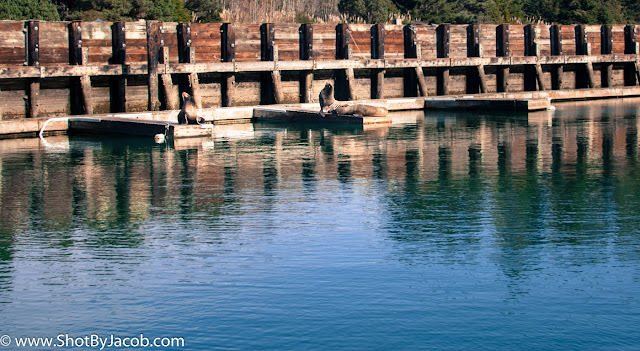 There were some sea Lions sunbathing on a few floating docks. I took a picture of them because their natural sunbathing positions were funny to look at. We decided to make our return trip home on Highway 1. I heard it was the most spectacular coastal drive and I was looking forward to photographing different places along the way. One such photo came pretty quickly after we left. 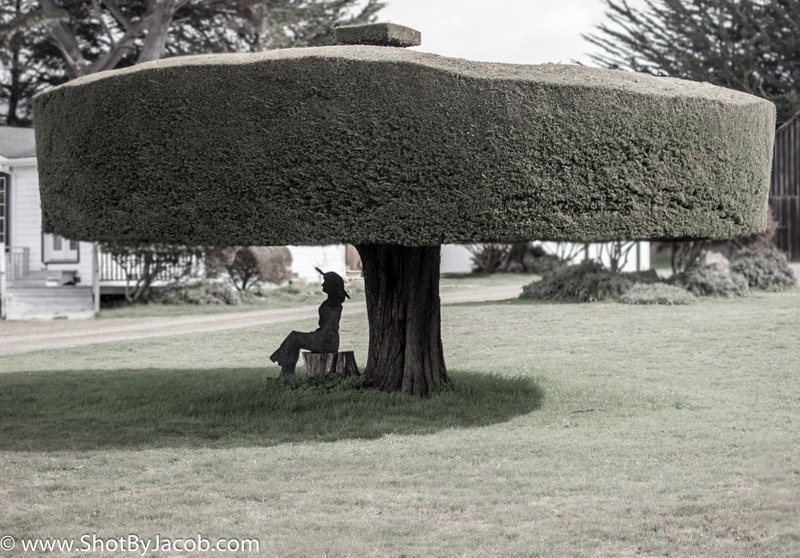 I saw a picture of a metal figure underneath a tree that was trimmed in the most peculiar way. I pulled over immediately to take the picture of what I thought was a pretty unique image. A little further down Highway 1 we came to Point Arena’s lighthouse. We drove down the road that leads to a beach just north of the lighthouse. We got out on a short walk that ended up being much longer than either of us expected. We finally got to the cold deserted beach. To the south we could see the peninsula and the lighthouse on it. I took plenty of photos both panoramic and in HDR to try to capture what I was looking at. 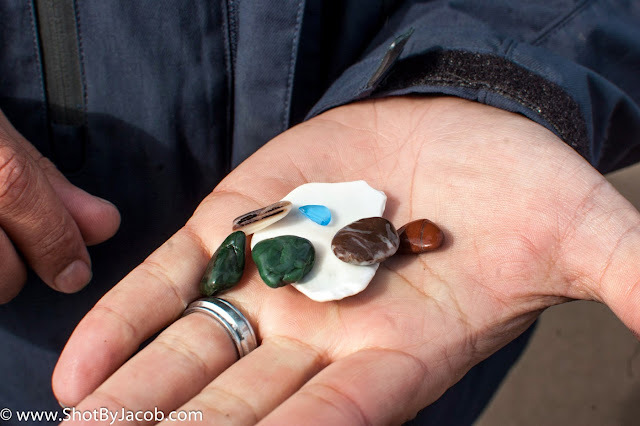 I had a lot of fun photographing the various objects found on the deserted beach. I wanted to take some home with me so I was out in the ocean picking up all the pretty shells I could find. The water was extremely cold and I didn’t last long scavenging for shells. 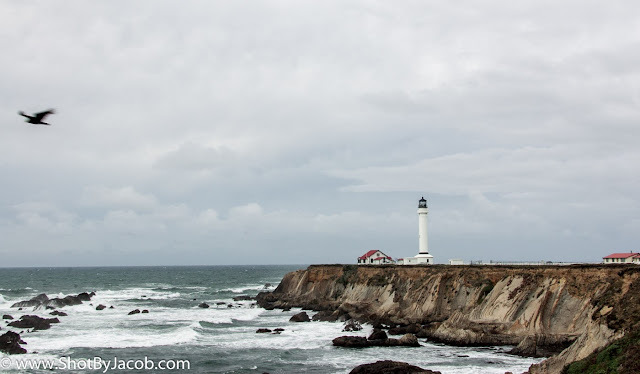 The Point Arena lighthouse is well worth the short 5 minute drive off Hwy 1 it takes to get there. Once you are on the grounds you have a couple things to do. The most obvious is climb to the top of the tallest lighthouse on the pacific coast. At the top you will learn a little history of the lighthouse as you soak in the 360 degree view of the peninsula and ocean. Once back on the ground you can visit the gift shop to take some unique souvenirs home with you. There is a small museum inside as well where you can see the First-order Fresnel lens built for the lighthouse. If you really want to soak up the entire coastal lighthouse experience I recommend staying the night, you can rent one of the vacation homes that are on site for a truly rare and enchanted experience. After taking as many photos as I felt I could we left the lighthouse and headed back down south. I knew I wanted to see the sunset at the Marin Headlands so we headed in that direction. Just before the great Golden Gate Bridge we turned off and headed to the top of the headlands as far west as you can go. We sat on top of the old pillbox in the cool wind and watched the sun dip below the clouds and into the ocean. The clouds were so thick that there was only a brief window to shoot the sun peeking through before it set into the ocean. Since we were right next to the Golden Gate Bridge our next subject was already decided. 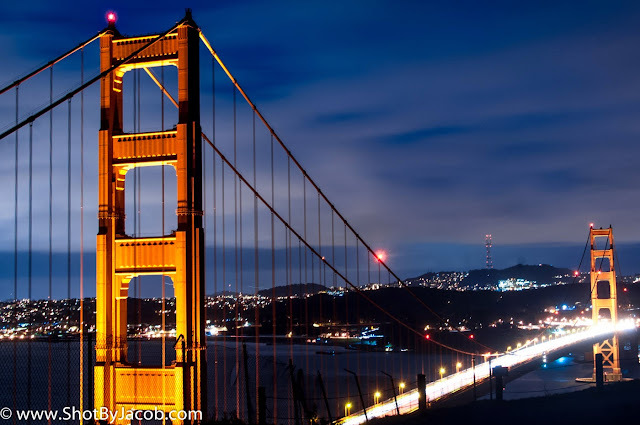 I got my tripod out and attached my 35mm prime and went to work on the Golden Gate Bridge. It was very cold and windy so there weren’t many tourists in my way. 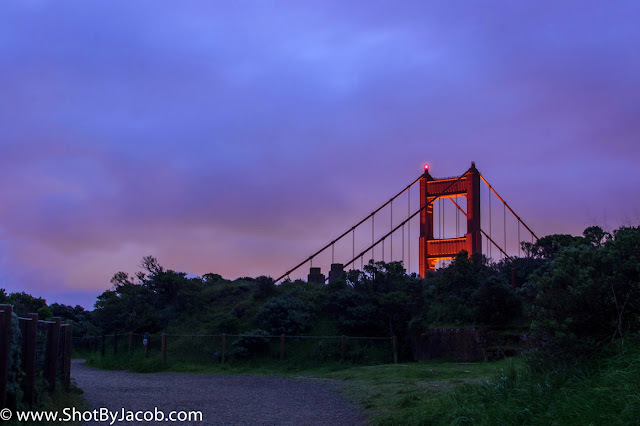 I shot plenty of pictures of the Golden Gate Bridge and of the surrounding area and when I felt that my fingers were going to fall off we headed back home. One last thing we did before calling our vacation complete was to have dinner at Texas Roadhouse. We left full and happy.